…or vest if you are American. I have been thinking about what I wanted to make with both the orange felted wool and brown merino jersey for long enough now. I have probably overthought the whole enterprise, which seems to be a common problem Chez Hood right now. The main problem I have is that there is barely 140cm of the orange cloth (after washing) and I have spent ages convincing myself I can’t do what I want with that much. Rubbish. I’m planning to self draft this pattern so I can make sure it fits the fabric available. Within reason. The other problem is that I can’t decide between two options. Think donkey between carrots. Yeah, that would be me at the moment and it isn’t going to get any better until I just get on with something! All of the pictures of waistcoats shown really appeal. The Poetry waistcoat has been in my ‘I like this’ pile of pictures for an age. I can’t even remember when I put the booklet on the heap. *sigh* . The All Saints version is a prettier version in my opinion – but I still can’t decide which I prefer. I know I want to have pockets, it would be useful to be able to close against the wind/weather, I don’t want it to look too voluminous, and I want to be able to layer garments with it. What would probably happen is a hybrid version with the sections I like best from both. 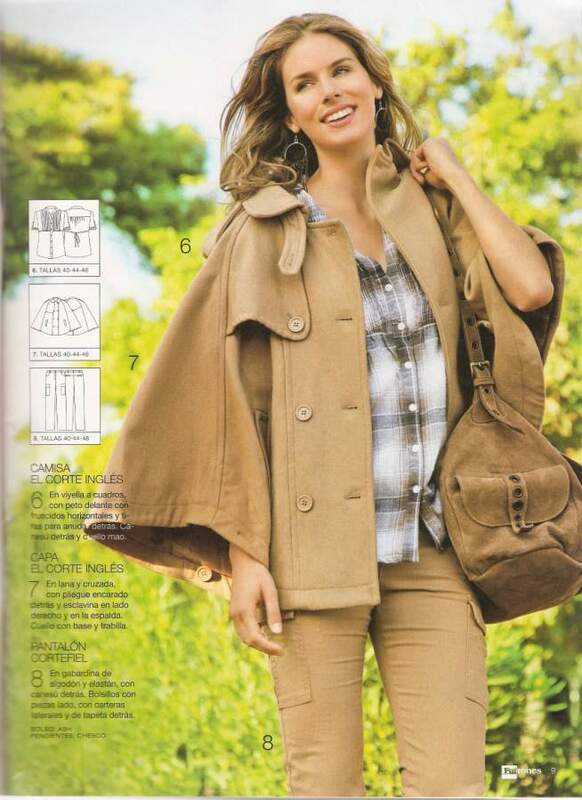 I thought a neater, more ‘jackety’ option may be more useful – a bit like the Marcy Tilton Vogue 8430. Not necessarily a real ‘jacket’ but something edging that way. I also liked the yellow Vogue 8932. Check out that back detail – and it could be made sleeveless. Sadly I can’t currently think of a sensible pocket option. Not something to kill the option but I would have liked a pocket. 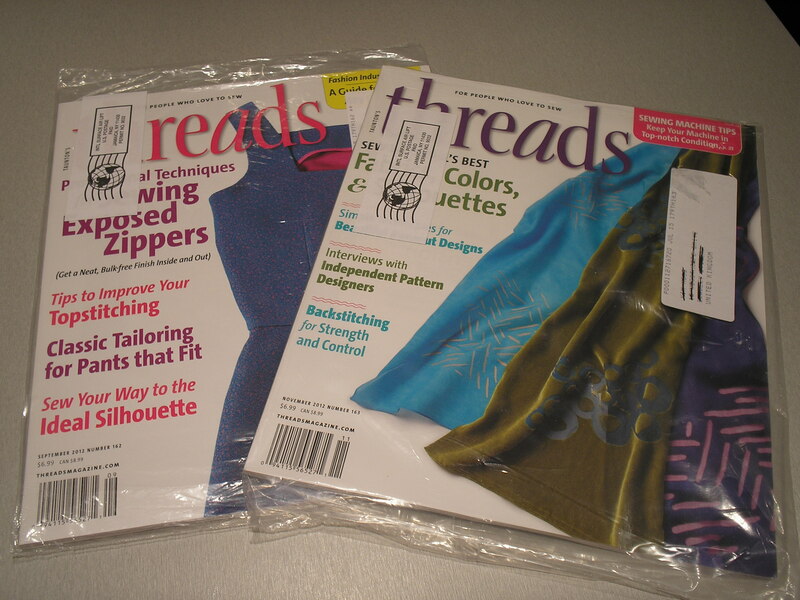 I’m going to start drawing the pattern for these garments and then just make a start. They aren’t so different so I may find that part way through I will make a final decision. I think I may be leaning towards the Yellow jacket, but after a cup of tea who knows. Any suggestions/preferences might be helpful – feel free to give opinions again. I have (I think) decided to re-stash the brown merino for now. There are a number of things i would like to do and I am starting to feel a bit bogged down. I really need to clear a couple of projects to loosen a mental ‘log jam’. Does anyone else find this happens to them? Yes, sorry. I have been seduced by the alice+olivia Vogue 1261 again. I am sad to say that my ‘happy top’ has been worn almost to extinction and really needed a replacement. This time I decided to make view B, which is the one with the cowl and set in rather than raglan sleeves. It is still pretty cold here in the UK and I wanted something to wear right now. After a quick trawl through my stash I came across what can only be called jersey ‘stuff’ which I can remember buying in Birmingham Rag Market for very little money. 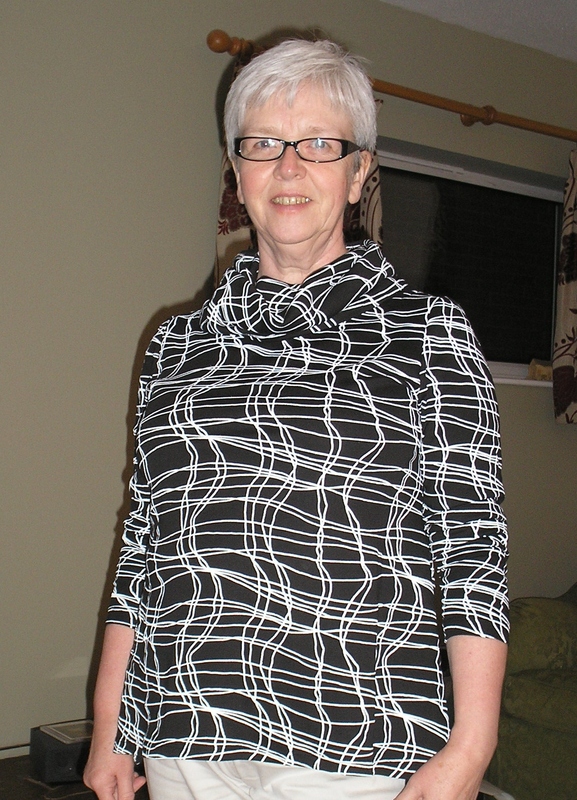 It is nice and soft, but a little firmer than the fabric I used for the previous incarnations of this top. I would guess it is a cotton or viscose, but with those painted lines it would be impossible to do a burn test! This was a very quick project, and as I had made view A , ahem, several times before I just went ahead and sewed from start to finish without trying on. 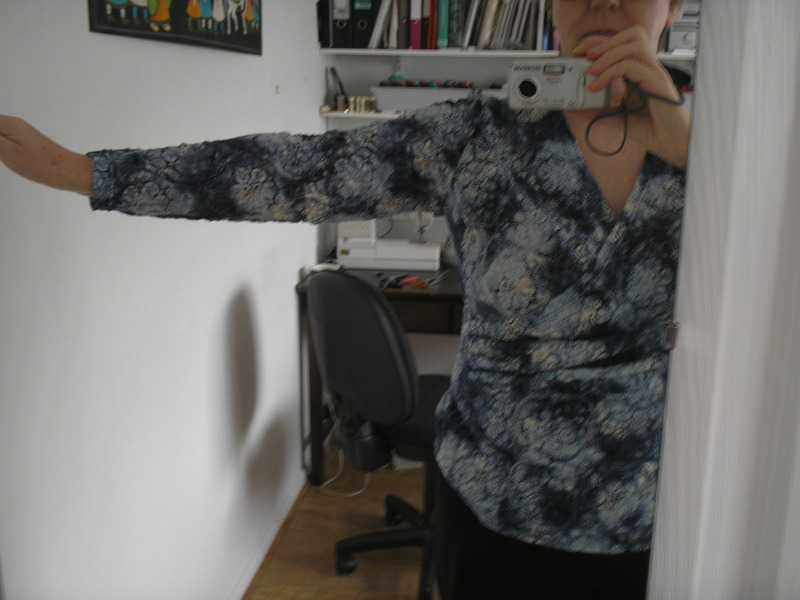 I narrowed the sleeves as before though I could probably have left a little more ease in this firmer fabric. It also appears to be a little shorter (probably not ‘dropping’ in the same way as the others) but I am quite happy. 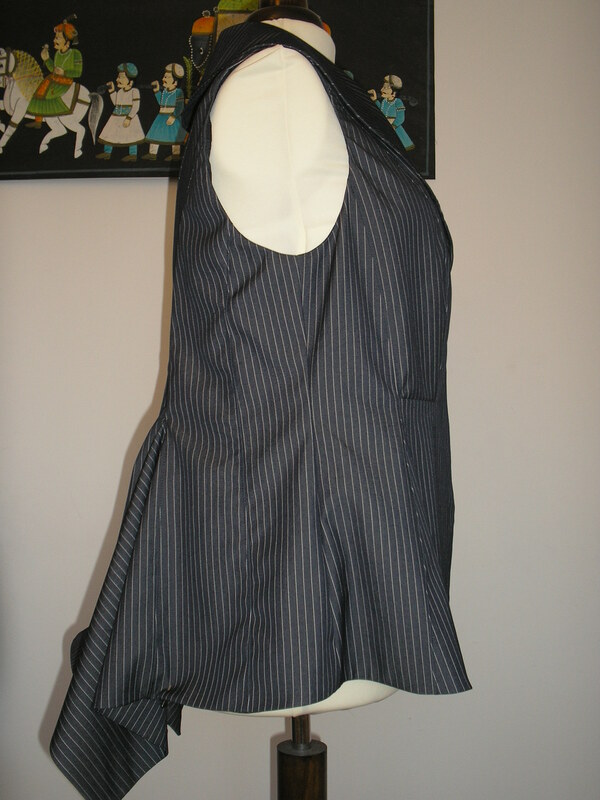 As this fabric is plain black on the inside I sewed the cowl with the right side to wrong side at the neckline seam so that the patterned side would be outside when I finished. The plain black does show a bit unless you spend some time organising the cowl so if I was making this again I would aim for a fabric that was OK to be seen on both sides. I am pretty happy with this, but will be looking out for another top to make. I have a number of t-shirts that appear to be nearing the end of their lives. Why do they all die at once? I was in a Charity Shop recently and happened to spot a small, green box out the corner of my eye. That isn’t a ?…..is it ?…..buy it now Kim! Lucky me! 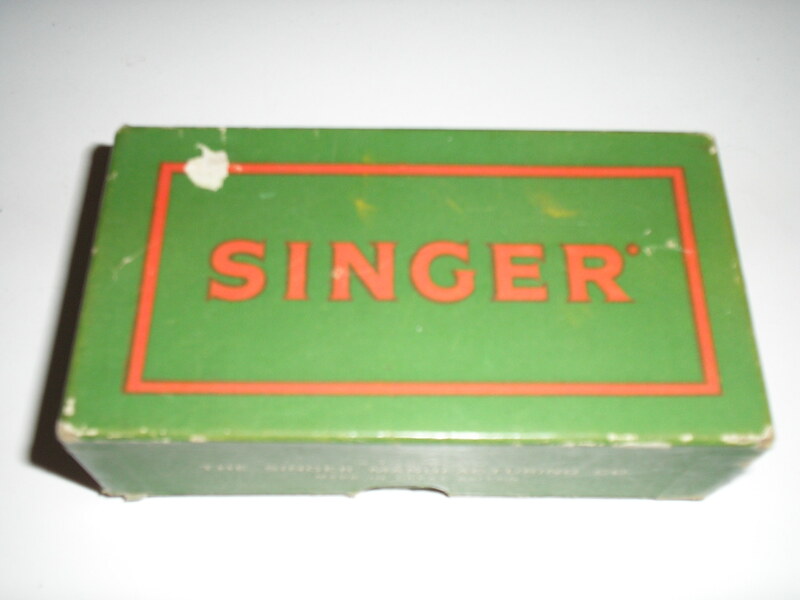 A Singer box! An old Singer box! I lifted the lid with some trepidation as it was labelled ‘spares’ but inside discovered a little huddle of machine feet and a couple of bobbins. Five Singer feet and other bits. 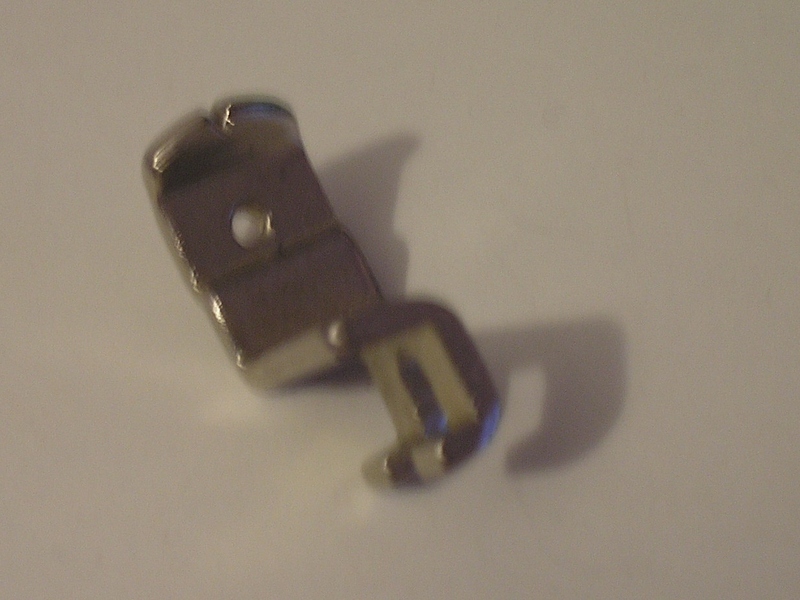 For £5 I have got a Ruffler, a binding foot, a rolled hem foot, an edge stitching/zipper foot, and another foot with a single hole in the middle (no other distinguishing features). 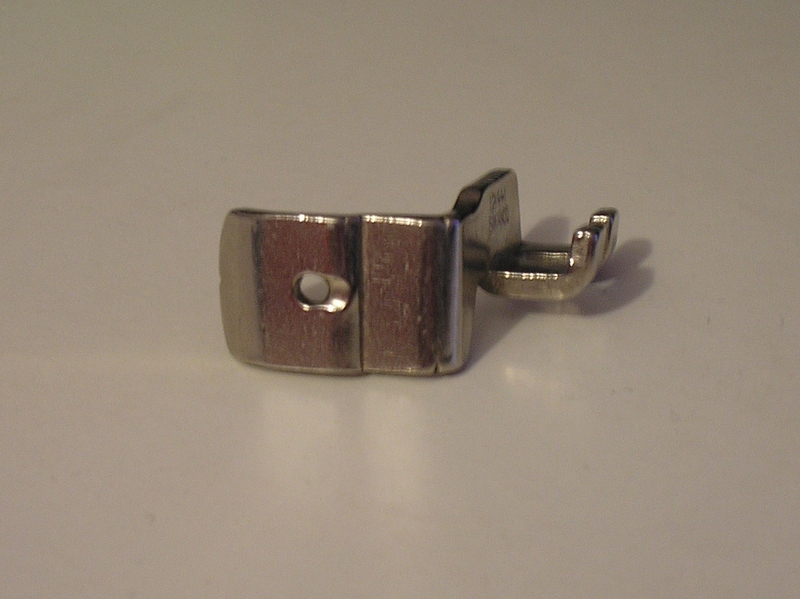 There is also a seam guide and two metal bobbins. How happy am I?! 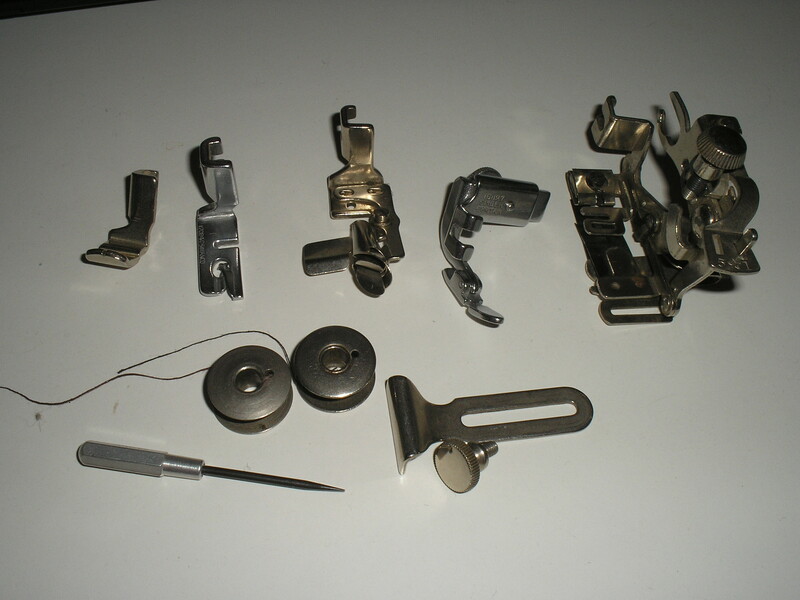 I think all of these will fit Molly, although with one hand winding I may find myself struggling to manipulate all that I need to with some of these feet. I have photographed the only foot I can’t identify on its own. Any ideas anyone? I hadn’t realised how long it has been since I posted. Please accept my apologies – I have been working on clearing ‘that pile’ of odd garments that we all seem to have which we intend to try and make more wearable. I may have managed with some of these but I will leave you to decide. I decided to make a start with this blue top that I ‘Quite liked’ but never really picked out to wear. After some deliberation I decided that the problem was the sleeve – it just felt a bit ‘baggy’ and carried on into the underarm. 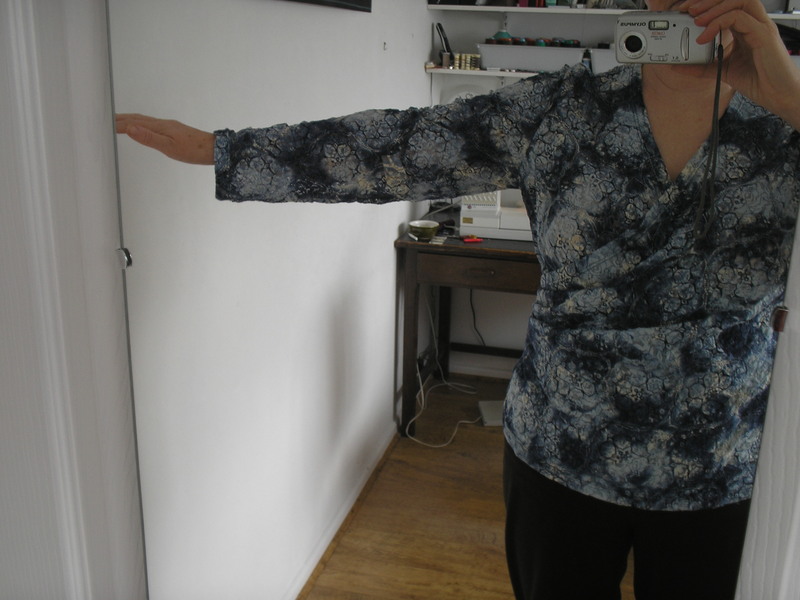 The fabric was not expensive so I was very happy to just run the sleeve through the overlocker to narrow it , continuing a little way into the body side seam. Better I think. 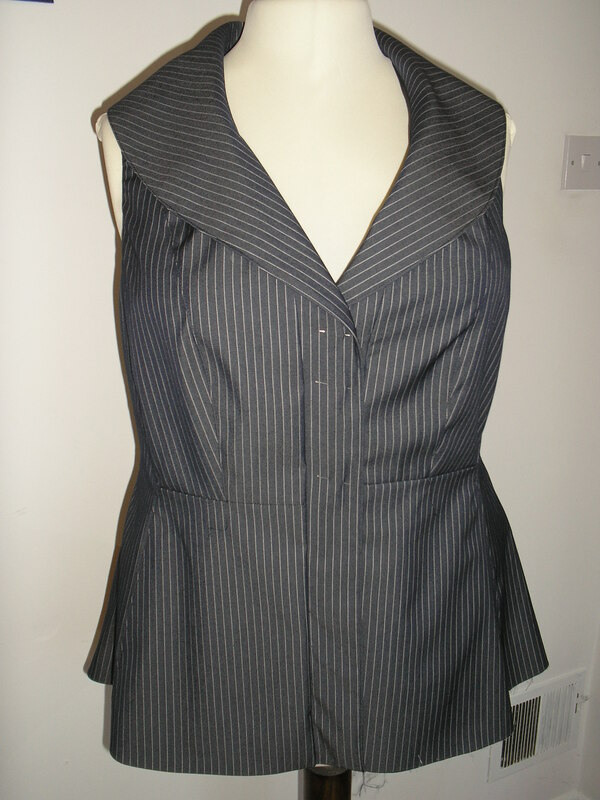 This top was from Burda magazine (10/2008) and whilst I quite like it I remember making an adjustment to tighten up the front neckline (to make it a bit more modest I think). In retrospect this really wasn’t necessary. Rear view – and those leggings! 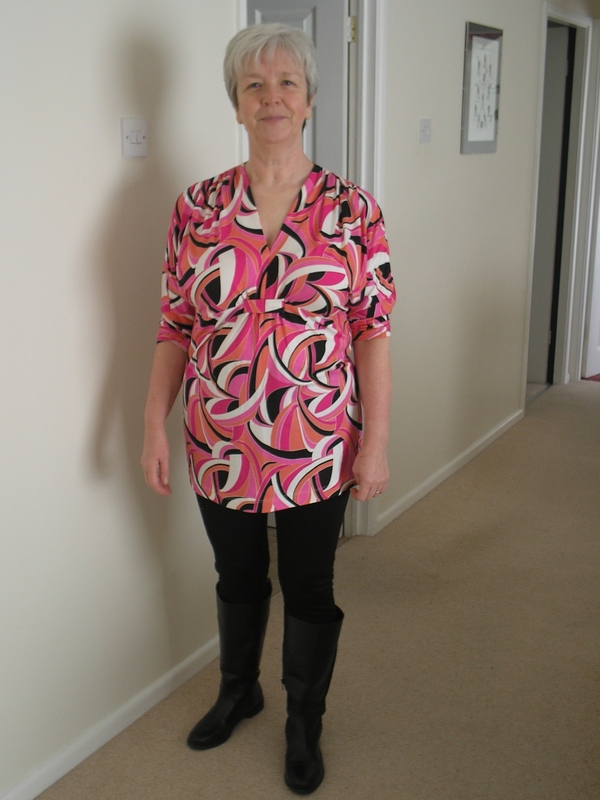 Tunic length – and Vogue 1214 leggings. I pulled out a dress in a fabulously bright (not what The Management called it!) cotton jersey. 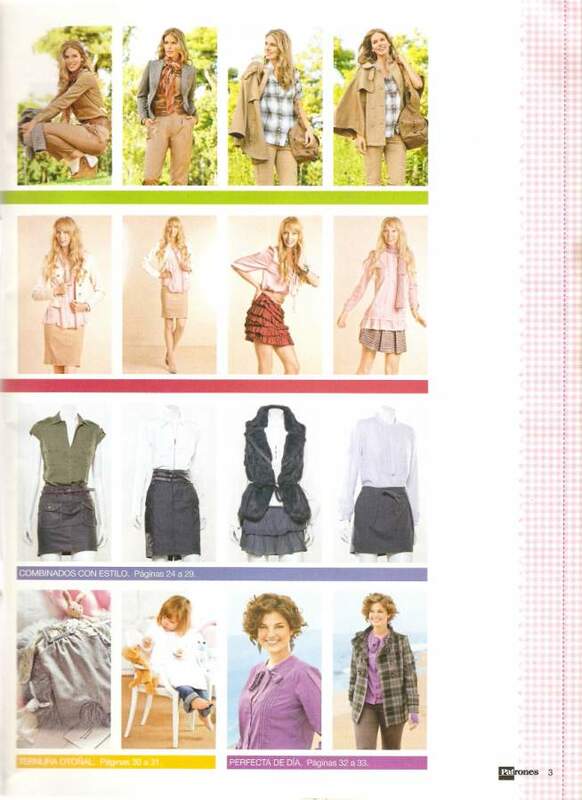 This was also from Burda 10/2008 – the magazine obviously hit a chord with me that month. I know this pattern is available on the Burda site to download and have seen some other versions blogged fairly recently. I love this dress. It would have been nice to have had a picture when it was a dress but I forgot that. Why wasn’t it worn? No idea. I have another version in purple crushed velvet which is my ‘go to’ dress for winter. 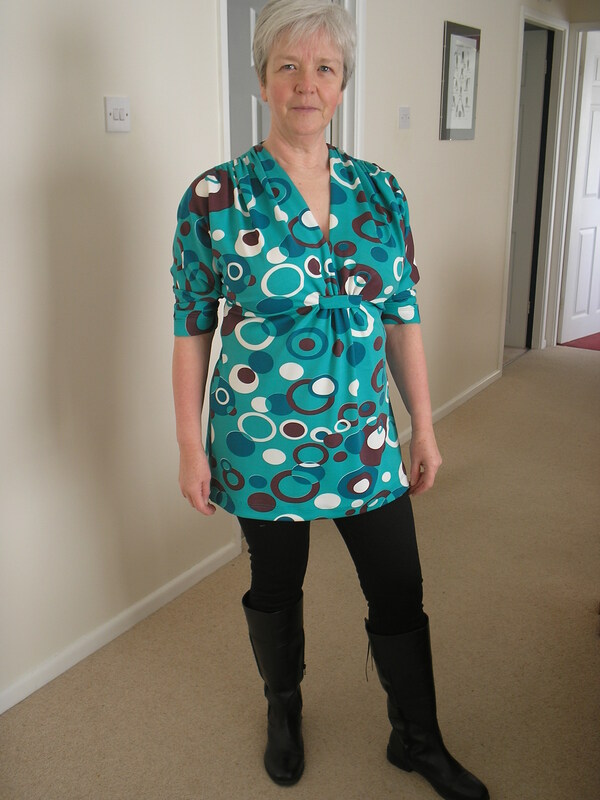 Anyway, as so many of my tops and t-shirts seem to be looking a bit sad I decided to convert this dress to tunic length. The hem is now about 24cm shorter than it was and I think I will probably wear it more now (that will make ‘him’ happy!). You might also notice the black leggings. Yes, they are the black Vogue 1214 leggings from the last post. I took the thigh seam in about an inch and graduated that to about 1cm (anyone else choose metric or imperial depending on whichever suits the purpose rather than sticking to one?) at the ankle. I had to go into the crotch seam a little but not significantly to do this so the body is almost as it was. 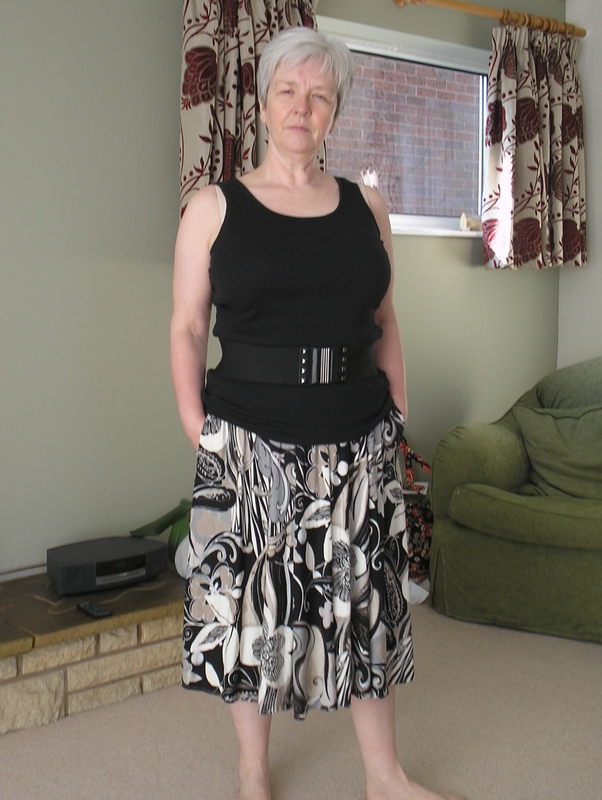 I did however add elastic into the band around the waist. It is a nice deep band, and I am sure it would have been just fine to hold the leggings up, but I’m a bit of a wuss and wanted the security of that elastic! I think I like these now – but I have bought the Papercut pattern that seems to be well regarded so I will try that next time. 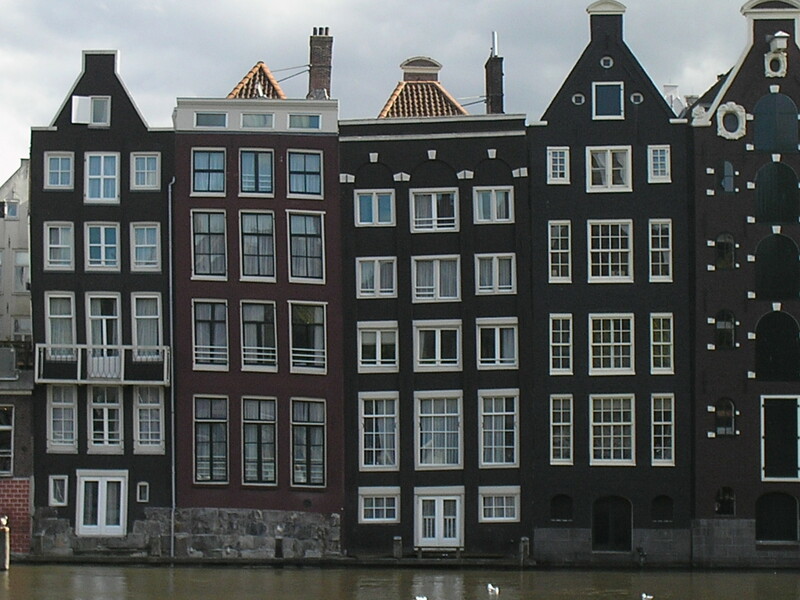 Yes – I really liked this pattern! I liked the adaption to the loud colourful dress so much I decided to shorten another from the pile. This is a polyester jersey that I bought from Birmingham – I can’t think why particularly but I do like it. And the pattern. So, another tunic. The next victim was a dress I made last year. This is Vogue 1027, and I really liked this when I first made it but it never felt quite right. The bust/waist ratio never felt quite right when I was wearing it. 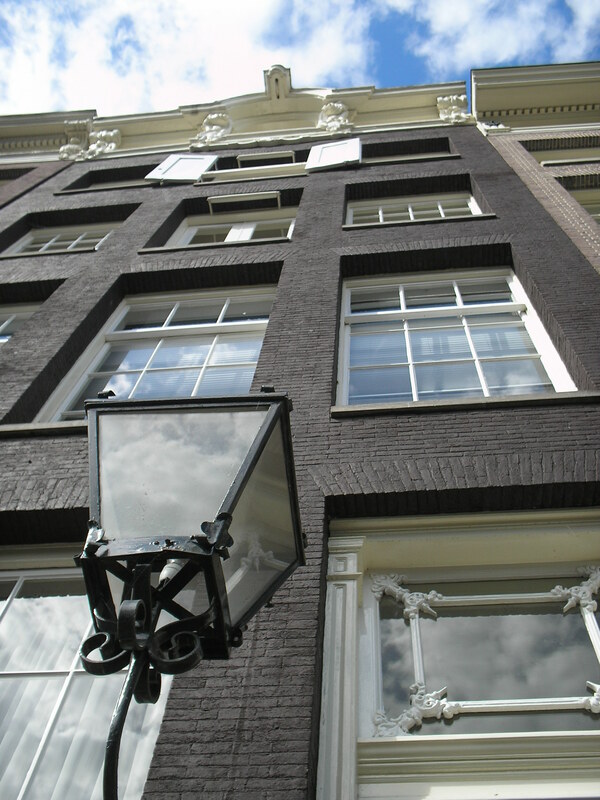 I was pretty upset about this – I thought I had found a real gem to make again and again. Maybe I am just not a dress sort of a gal. Or not the ones I have been choosing. Scissors at the ready, and now it is a skirt – with pockets. Don’t you just love pockets to swing in? Pockets in skirts are great! I suspect it may get more ‘outings’ now that it is a skirt but I would still love to find that elusive dress that would make my wardrobe sing. I love the idea of dresses even though I am not a ‘girly girl’ . Maybe this on was too full skirted. Maybe there is just too much me. I am not going to get upset about the previous mistakes as I think you have to try new things out to have a wonderful surprise from time to time. I have also been knitting – and that Kim Hargreaves sweater is almost finished now. I think that will probably get a bit more attention to get it to the finish line! 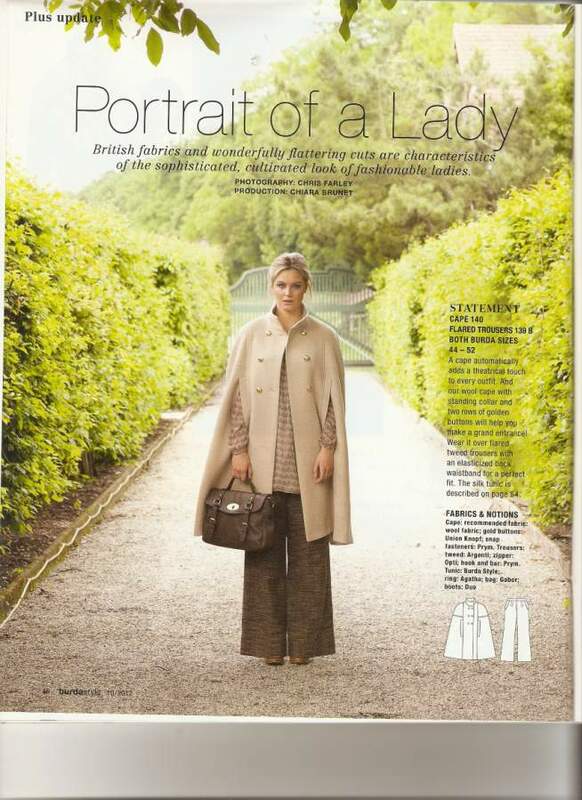 What it really needs is a pair of smart trousers to go with it …..
Vogue 1214 – Not quite right. I’m not entirely happy at the moment. 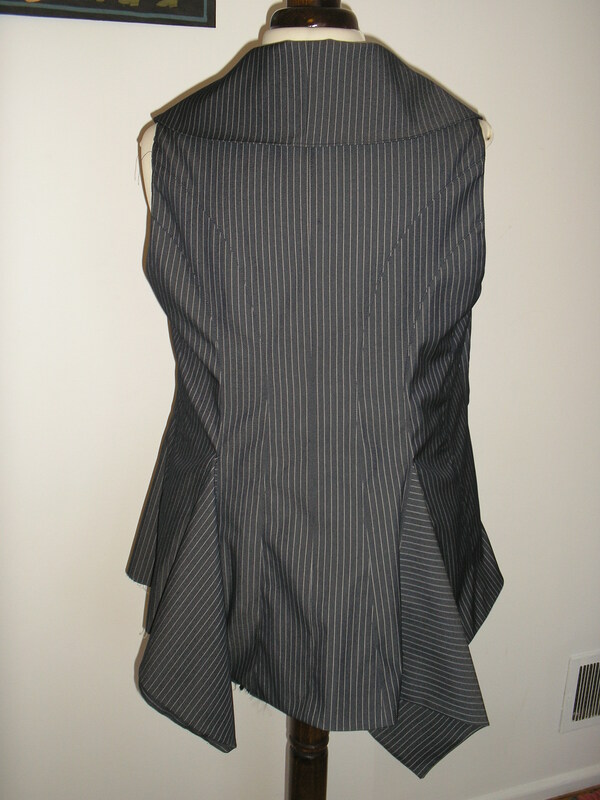 I have worked on the Alice+Olivia vest/waistcoat this week and got almost to finished. For some strange reason I decided to try it on again yesterday after the lining was almost completely in place. And something is not quite right. I can’t decide what I am not happy with (because I still like the basic garment) – but something is just ‘off’. Darn. I split the front piece and made a princess seam to make a FBA. Maybe this made it wrong. Or it could be that I have added a bit too much allowance for my thick waist. As the whole thing is within an ace of being finished, and is top-stitched to blazes, I am going to put it away quietly for a week or two (not too long or it will become a UFO!) and come back to it fresh. I have photographs but the stripe in the fabric looks a bit weird on them. Sorry. 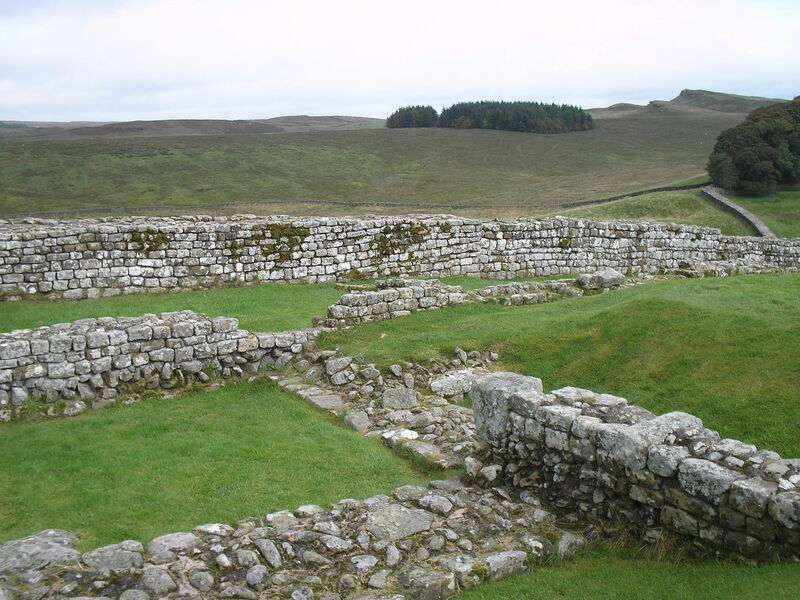 Front – not as bad as this on me – but bad. 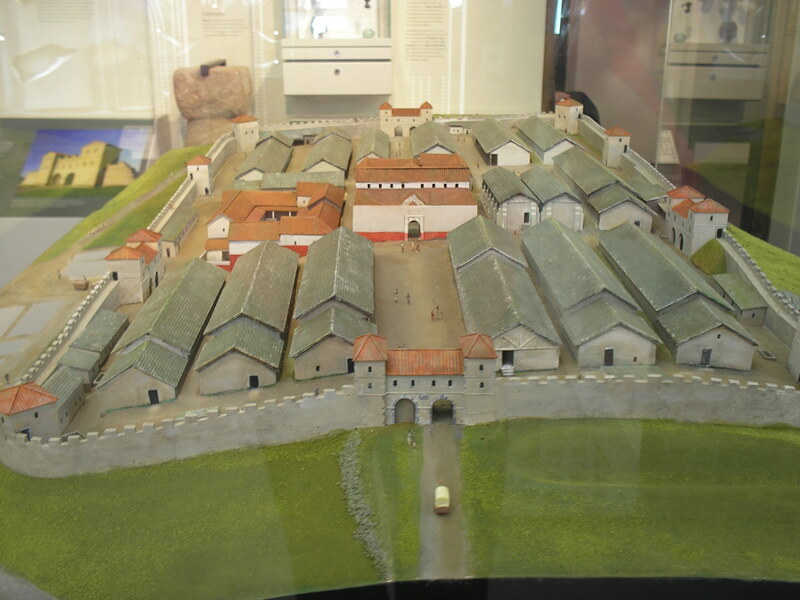 Side view – what can I say? 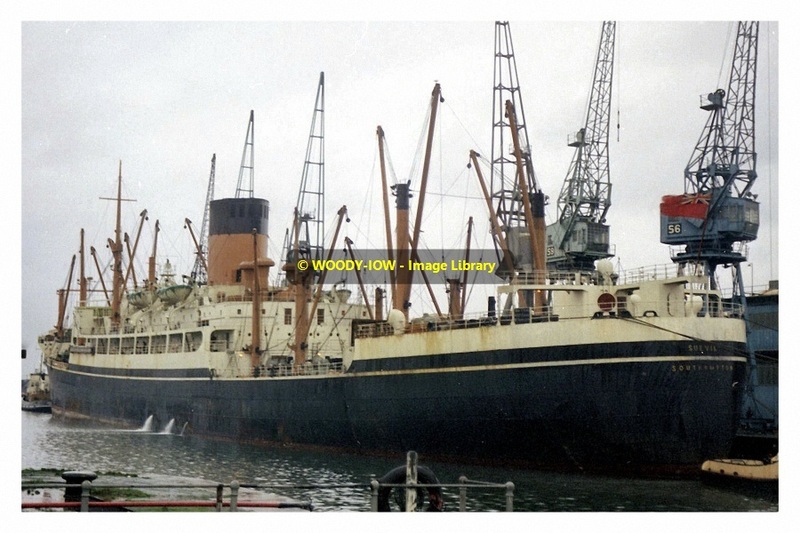 Back – A bit ‘baggy’ and maybe too long? I really do think the best thing I can do at present is walk away from this project. I have decided to edit my wardrobe before I do any more sewing for myself. I know that there are some howling gaps in there but I really do need to get everything out into daylight, try on everything, and be really ruthless about what stays. In common with most of the population (according to the popular press) I wear about half of my clothes and the rest seem to be in the cupboards/drawers as insulation. Got to stop. We people who sew are lucky to be able to create exactly what we want/need. In my case I just need to be a lot more disciplined! Over the next few days I will start making a list and going through the stash to see what will fill the gaps. One of the things I have been lusting after for some little while (and the weather here in Worcestershire is now just right for it) is a cape. I like both of these capes although they are quite different in character. I think I am leaning slightly toward the shorter, more casual, Patrones version but I am still concerned that I may end up looking like Batman’s elderly Auntie. Any suggestions? I can’t believe how slowly Vogue 1214 is coming along. I haven’t been faithful to my ’30 minutes for me’ time – and doesn’t it show. 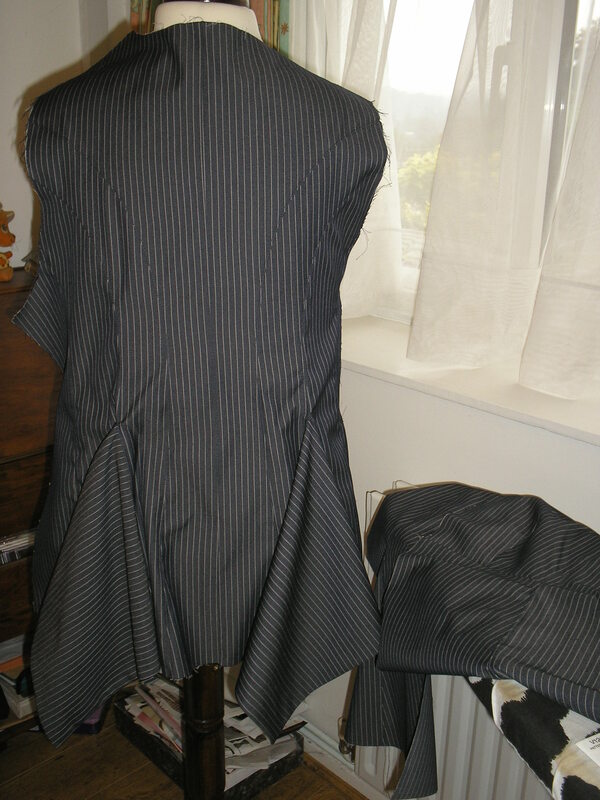 The back and fronts are made – but not sewn together. 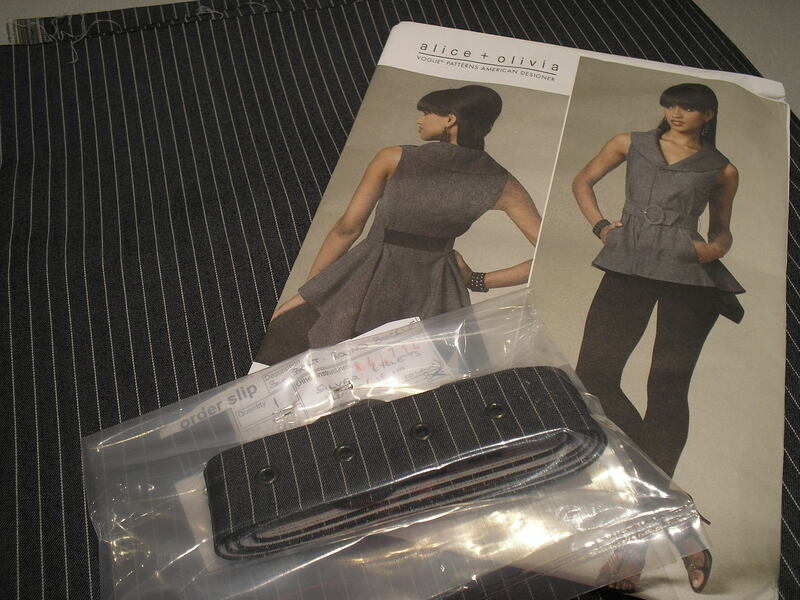 The lining is cut out – but not sewn. 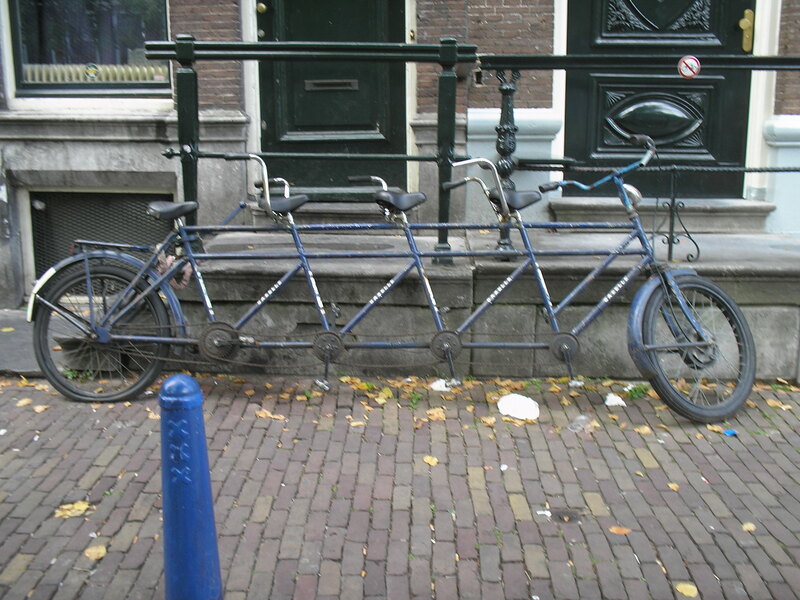 The pieces that need to be interfaced are still waiting. Really not very good progress at all! And yet I like it so far (despite having sewn one of the back godets in twice as the stripes were going in different directions). Still in bits – but I like it! I did look at the different comments on Pattern review about this particular pattern and was very amused to see the godets referred to as ‘Mud flaps’ in one of the reviews! Tee hee! General opinion seemed to be mixed about how good/bad they were – but I like them so they are staying. I hope to be able to get this finished this week. I get bored if I spend too long on a garment so I don’t want this to suffer that fate. One of the reasons I have been so slow on this was I visited my darling daughter in London this weekend. I took the opportunity to visit the V&A (again!) to see the Ballgowns exhibition they have a t the moment – I thought it was well worth going to see. I bought the book as you weren’t allowed to take photographs so I am able to enjoy them all over again. There was also a display in the gallery with the wrought iron in (on the third floor I think) of garments inspired by Armour I will post about that separately. This trip was mainly to support my daughter in what was her second half marathon at the Royal Parks Half Marathon – she did the first last week in Ealing. It was never the intention to do a marathon with a rest in the middle but she did just that – and did it very well finishing both in under 2 hours 15 minutes. Pardon the gloat but I am one very proud mother. Check out the medals! 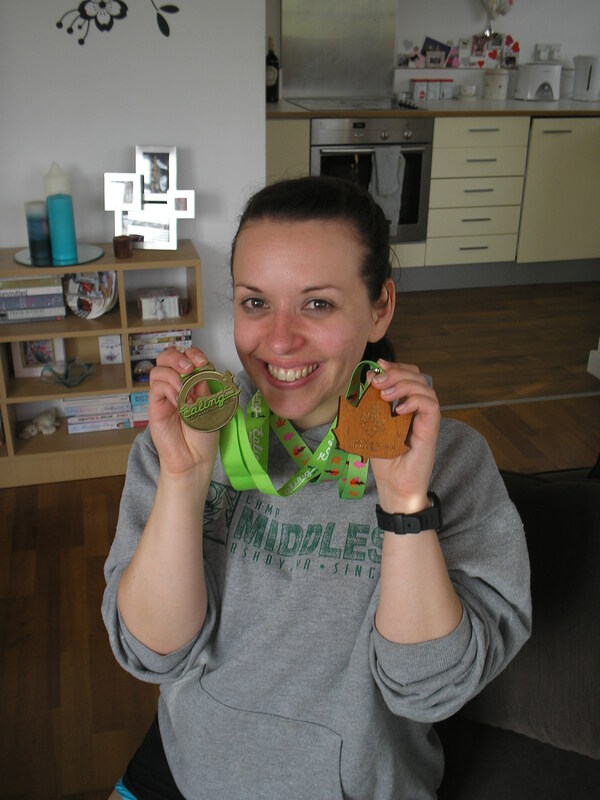 Two half marathon medals – Well done DD! 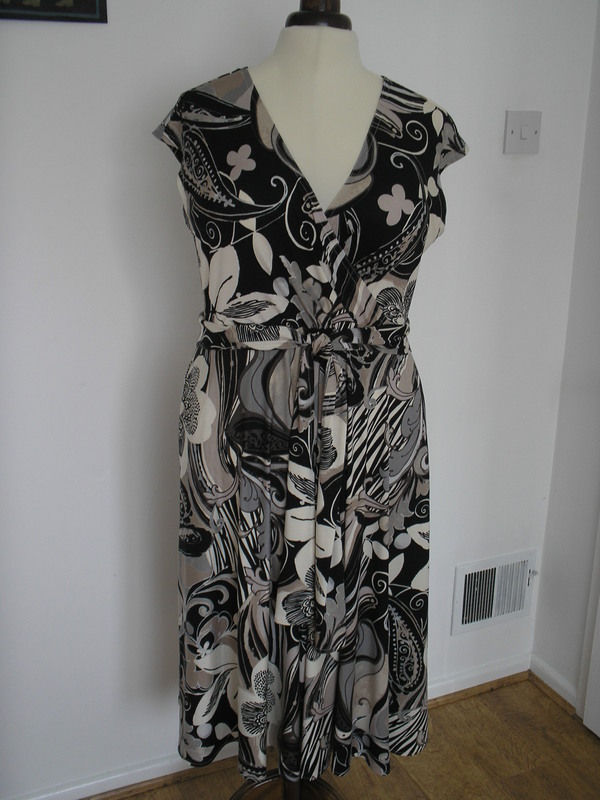 I have had the first item in my Summer 6PAC finished for a few days now – I actually managed to finish my dress from Vogue pattern 1287 on Sunday during the European Cup final (Football/soccer for anyone lucky enough to not know what I am talking about!) but have only just managed to pin the management down to take photographs. As I said in my last post there were a gazillion markings to be transfered onto the fabric before sewing. Don’t be tempted to skip this part – they really are essential. Even with all the marks tailor tacked I had to refer to the pattern pieces a couple of times. I think when I make this again (because I really LOVE this one!) I will use different coloured threads to keep me organised. I feel much happier in this more fitted skirt than I am in the other DKNY (Vogue 1027) pattern I made. I like that dress but don’t feel as comfortable wearing it as this one, or the Vena Cava (Vogue 1258) ‘Yowsa’ dress I made late last year. Any ideas why ladies? This dress was fairly easy to sew, even given the amount of tacks and tucks, and although I made a straight size 16 it fits fine. I would say that it could be considered to come up large so if you are considering it I would probably advise using a smaller size than you would usually use but do check the ease allowance you want. I have fairly sizable ‘assetts’ but no hips to speak of and I love the fit. This dress disguises all the ‘baggy bits’ around my tum but doesn’t look like a tent. I took a lead from Alison C who had already made this dress and put elastic all round the waist rather than just into the back section. I stitched the sides of the front section to keep that area flat, but having the elastic inside the casing just keeps the front stiffer and looking neat. The pattern suggests using stretch silk or similar for the dress but I really like it made in this viscose jersey print from stock. 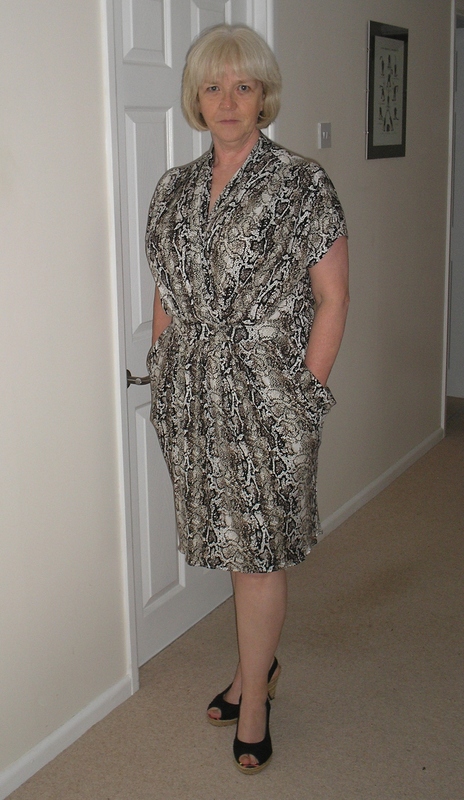 I have been looking for an excuse to sew this snake print and I am very happy with this dress. I didn’t make the slip which is included in the pattern – I have other slips I could wear if required but I think this looks just fine without. I am going away diving next week and packing space is always a bit short on those trips but this is going into the bag (rolled up to save space) as my one ‘smart’ garment. Still using the 30 minute slots at the end of my working day I have started the first ‘column’ for the 6PAC in black. I know, not a very summery colour but one I wear a lot and it will also see me into autumn. Despite having made the ‘dress in a linking print’ I confess that I haven’t decided what my second main fabric is going to be! P.S. Pictures are indoors again as it is raining here. Again (or still depending on how you look at it). Perhaps when Wimbledon is over we will get some sunshine!